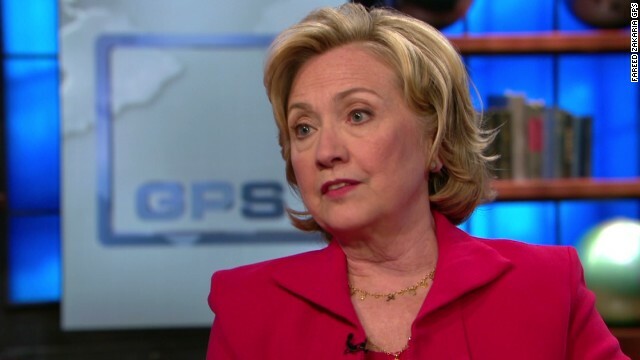 CNN’s FAREED ZAKARIA GPS featured an interview with Former Secretary of State Hillary Clinton. Clinton spoke with Fareed about the Russian Reset, the United States’ relationship with Vladimir Putin, and the crisis between Israel and the Palestinians in the Middle East. CLINTON: — insofar as possible, um, proved difficult to deal with him. You know, he acts, you know, bored and dismissive. So he has a lot of personas that he pulls out if he wants to stare intently at you with his very, you know, bright blue eyes, because he wants something from you or he wants to convey a message to you, he can turn on the charm. But he can also be, you know, very tough to deal with and act as though it’s a burden on him to be in conversations with other world leaders. First, I think if there were any doubt, it should be gone by now, that Vladimir Putin, certainly indirectly, through his support of the insurgents in Eastern Ukraine and the supply of advanced weapons and, frankly, the presence of Russian special forces and intelligence agents bears responsibility for what happened to, uh, the shoot down of the airline. FAREED ZAKARIA, HOST: Joining me now is the former first lady of the United States, the former senator from the state of New York, the former Secretary of State of the United States, Hillary Clinton. “Hard Choices” is Mrs. Clinton’s recently published memoir of her time as America’s 67th Secretary of State. Welcome. HILLARY RODHAM CLINTON, FORMER SECRETARY OF STATE: Hello. Thank you, Fareed. I’m delighted to be here. ZAKARIA: First, the stuff in the news. ZAKARIA: There are a lot of people who feel that President Obama is not being tough enough on Vladimir Putin, on Russia. Do you think he’s handling the Ukrainian crisis appropriately? CLINTON: Well, Fareed, I think that he is facing some of the same challenges that American presidents face when dealing with threats within Europe. The United States, obviously, has a great interest in helping to maintain peace and security in Europe and we have a formal alliance, NATO, to do so. But much of what we can do and what the president is calling for requires the full participation of our European friends and allies. And I would make three quick points. First, I think if there were any doubt, it should be gone by now, that Vladimir Putin, certainly indirectly, through his support of the insurgents in Eastern Ukraine and the supply of advanced weapons and, frankly, the presence of Russian special forces and intelligence agents bears responsibility for what happened to the shoot down of the airline. Therefore, we have to up the sanctions that are required. The United States has continued to move forward on that. Europe has been reluctant. They need to understand they must stand up to Vladimir Putin. That brings me to my second point, is that the reluctance has to do with European dependence on energy from Russia. But I would remind my European friends, as I did when I was Secretary of State and write about in my book, that they have to become more energy independent and diversify their energy supplies. Russia doesn’t have, yet, that many markets. They are also dependent upon the European market. So I think the Europeans can go much further in sanctions and should do so as quickly as possible. And finally, it’s in the interests of Europe and the United States to help the Ukrainians secure their borders, up the training and supplying of the Ukrainian military forces and, of course, continue to stress the need for reform, political and economic, inside Ukraine. All of that should be done simultaneously. ZAKARIA: You say in the book that you felt — and you’ve said in interviews subsequently — that the reset with Russia worked because you got a new strategic arms treaty out of it, you got the Russians to agree to sanctions on Iran. Why do you think, then, that it stopped working? What changed? CLINTON: Well, I thought a lot about that, because I was among the most skeptical of Putin during the time that I was there, in part because I thought he had never given up on his vision of bringing Mother Russia back to the forefront, not by looking at what Russia could do to be a modern nation, but by looking to the past, and especially trying to control their borders from Central Asia to the Baltics. So when he announced in the fall of 2011 that he would be changing positions with Medvedev, I knew that he would be more difficult to deal with. He had been always the power behind Medvedev, but he had given Medvedev a lot of independence to do exactly what you said and make the reset a success. I saw that firsthand with respect to the parliamentary elections in Russia, because they were filled with irregularities and Russian people poured out in the streets to protest. And I, as secretary of State, said the Russians deserve better. They deserved elections that reflected their will. Putin attacked me personally because he is very worried about any kind of internal dissent. She wanted to clamp down on any opposition within Russia and he wanted to provide more influence and even intimidation on his borders. And I, you know, certainly made my views known in, you know, in meetings, as well as in memos to the president. I think that what may have happened is that both the United States and Europe were really hoping for the best from Putin as a — a returned president. And I think we’ve been quickly, unfortunately, disabused of those hopes. Putin is playing the long game. He has a strategic plan in mind, the Eurasian Union, which would be in competition to Europe. His continuing efforts to intimidate Europeans, not just through energy, but through interfering in elections, putting money behind buying press outlets in European countries, and the like, trying to discourage countries like Ukraine, you know, being able to join the European Union. And if the — if the United States and Europe don’t present a united front, I think Putin is the kind of man who will go as far as he can get away with. I think he is still smart enough and cautious enough to be pushed back. But there has to be a push in order to make that happen. ZAKARIA: You have dealt with lots of strongmen in your life. ZAKARIA: What — assess Putin. You write about him in the book. And there’s this one moment — the only point at which he’s genial toward you is when you talk — would talk about saving tigers in Siberia. Other than that, he comes across as a pretty tough character. How does he — I mean so much of what people do is psychologically analyze Putin. ZAKARIA: So you tell us, what is he like as a man? You’ve met him many times. CLINTON: — insofar as possible, proved difficult to deal with him. You know, he acts, you know, bored and dismissive. So he has a lot of personas that he pulls out if he wants to stare intently at you with his very, you know, bright blue eyes, because he wants something from you or he wants to convey a message to you, he can turn on the charm. But he can also be, you know, very tough to deal with and act as though it’s a burden on him to be in conversations with other world leaders. I would be delighted if the United States could have a positive relationship with Russia and I would be thrilled if the Russian people, who are so capable, had a normal country that they could chart a different future. I think that will be next to impossible, at least for the short-term, with Putin. ZAKARIA: He wanted a presidential summit, which you advised against and it didn’t happen. Do you think that part of what may have gone wrong was he felt that you — you dissed him? CLINTON: No, because here’s what happened. When he was reelected, there was a G8 summit that President Obama was hosting, which he told us he would attend and then decided not to. Then there was a G20 summit in Los Cabos and the president — our president had a meeting scheduled. He kept President Obama waiting 40 minutes before he showed up. He sat down. It was a very small meeting, you know, on both sides of the table. We, at the time, were very, hopeful, not realistically so, but idealistically so, that we could get more cooperation from Russia to slow down Assad and what he was doing in Syria. Putin could not have looked more bored, more, you know, discomfited, and never apologized for being late. So then, of course, he wanted a summit in Russia. He wanted to play the host. And my advice to the president was don’t go chasing after him. I mean, we’re not sure of what his real intent is. We may be back into the prior administration’s problems where he invaded Georgia and, you know, never adequately responded to the legitimate concerns of the international community. They stopped, you know, the conflict, but basically tried to get people to recognize, you know, these two provinces in Georgia as independent of Georgia. I said, let’s wait and see what we’re really doing with him, because if the president had gone to a summit where he had masterminded the photo-ops so that it looked as though President Obama was really supporting him before we really knew what he was doing, I thought that would have been a mistake. ZAKARIA: We’ll be right back with much more with Hillary Clinton…next up: the many crises in the Middle East. ZAKARIA: Charles Krauthammer, the conservative critic, has said, “The world is going to hell and President Obama is playing golf.” Is he playing too much golf while all these crises are popping up? CLINTON: No. I think that’s an unfair comment to make. I know from my own experience with the president, where we worked so closely together, and as I write in the book, you know, went from being adversaries to partners to friends, that he is constantly working and thinking. But he also wants to do what will make a difference, not just perform. He wants to be sure that we know what the consequences, both intended and unintended, are. When it comes to the Middle East, this is always a very difficult issue for any American president. I have said publicly, and I believe it, that Hamas provoked Israel in order to actually cause what we are now seeing. And there are many reasons for that. I negotiated the last cease-fire in November of 2012 and I know very well how difficult it is, even when, at that time, we had a putative ally of Hamas with the Muslim Brotherhood and Morsy in charge in Cairo, it was still difficult. And we had to work hard to end the violence at that time. And I think the president is doing what he can do to try to get a cease-fire and then see whether we can sort out some, you know, longer-term resolution. ZAKARIA: You say you had a complicated, and it sounded like a difficult relationship with him. CLINTON: Well, I have to say, I’ve known Bibi a long time. And I have a very good relationship with him, in part because we can yell at each other and we do. And I was often the designated yeller. Something would happen, a new settlement announcement would come and I would call him up, “What are you doing, you’ve got to stop this.” And we understood each other, because I know how hard it is to be the leader of a relatively small country that is under constant pressure, and does face a lot of legitimate threats to its existence from those around it. And I also care deeply about how Israel is able not just to survive, but thrive, and just fundamentally disagreed with Bibi in the ’90s that I was in favor of a two-state solution. I was the first person associated with any administration to say that out loud. And he did not. But then when he came back in in 2009, he did. And I’ve sat with him, as you and I are sitting, and I really believed that if he thought he could get adequate security guarantees for a long enough period of time, he would be able to resolve everything with the exception of Jerusalem, which is the hardest issue. You can get borders and if you can figure out how to do security within those borders, some of which may require having IDF and international forces in the Jordan Valley, for example, then if you could move toward a state and leave Jerusalem to be worked on, because that’s the hardest issue for all sides. ZAKARIA: But, you know, he gave an interview recently to, I think it was The Times of Israel where he said there are no circumstances under which we will ever relinquish security control of the area west of the Jordan, meaning, the West Bank. That sounds like it’s a — it’s going back on his acceptance of the two-state solution. CLINTON: Well, Fareed, I see that as an — as an opening negotiating position, because I’ve had the private one-on-one conversations and the private conversations with him sitting there and — and Mahmoud Abbas sitting there and George Mitchell sitting there. And I know that Abbas, in my conversations, was willing to entertain a number of years where there could be some continuing security. Remember, the IDF — the Israel Defense Forces — have a working relationship with the Palestinian Authority security forces, which have been incredibly professional. We’ve helped to provide training, as has Jordan and others, and the positions that Netanyahu has taken. Now, once they take a position, and I know the years that Abbas has said are — are permitted and — and I know the years that Bibi has demanded, you’re in a negotiation. But if there’s no process going on, which is why we can’t even leave the vacuum of no process, despite how incredibly frustrating it is, then, of course Abbas is going to say never, not under any circumstances, and Bibi is going to say absolutely forever. ZAKARIA: In 2009, you said that you wanted Israel settlement activity to stop. In fact, you were pretty blunt. You said no exceptions. ZAKARIA: You write in the book that that was a tactical mistake because it made on — Bibi Netanyahu get even more hardline. ZAKARIA: — look at what they’re doing. CLINTON: This is my biggest complaint, with the Israeli government. I am a strong supporter of Israel, a strong supporter of their right to defense themselves. But the continuing settlements, which have been denounced by successive American administrations on both sides of the aisle, are clearly a terrible signal to send, if, at the same time, you claim you’re looking for a two-state solution. Now, when I was negotiating and I had been able to put together three face-to-face meetings between Netanyahu and Abbas, it was clear that if we were working off the ’67 borders, which was our stated position that President Obama had outlined, some of the settlements would be within any responsible drawing of borders for Israel. But a number of them would not. And those that would not would have to be either dismantled or live under Palestinian rule. There are deep wells of mistrust and misunderstanding on both sides. And what I’ve urged the Israelis to do is do more to help the Palestinians in the West Bank right now. Don’t monopolize the water. Don’t make it difficult to build. So even while we’re struggling over the end issues that would resolve the conflict, like borders, don’t make life so miserable, you know, because that’s not any way to begin to try to deal with the mistrust. You know, the longer I do this, Fareed, the more convinced I am that mistrust and misunderstanding are often the real fundamental obstacles to bringing people together. And that means that people from both sides of whatever divide it is, whether it’s Israeli, Palestinian, you know, Russian-speaking, Ukraine-speaking, whatever it might be, people have to start listening and working together to build habits of cooperation that might possibly lead to greater trust. ZAKARIA: Perhaps even in Washington. CLINTON: You’re 100 percent right. I — you know, I’m asked this all the time as I travel around the country. What can we do? And, you know, when you are dealing with implacable advisories who believe their version of reality is right and yours is misguided, it’s not easy. But at the same time, you can’t ever give up trying. And that’s especially important in a democracy. Thankfully, we don’t have, you know, the level of violence and conflict that we’re looking at in other places in the world. But we don’t have enough trust. And trust is the glue that holds a democracy together. And one of our biggest challenges is how do we, you know, rebuild that? Zakaria: We’ll be back; Hillary Clinton is my guest for the hour. When we come back, I’ll ask her about her vote authorizing the war in Iraq. Why does she now believe it was a mistake? ZAKARIA: You’ve said that you felt that your vote on Iraq was a mistake. ZAKARIA: … what do you look at and say, gosh, you know, this is — going into the future, here’s what I want to have learned? CLINTON: Right. Well, I learned to be far more skeptical of what I’m told by presidents, no matter who the presidents are, and also to be much more cautious, always, in any action or vote that could lead to the use of American military power and most particularly what we call boots on the ground. With respect to that vote, I’ve thought a lot about it, obviously, over the years. I had worked closely with President Bush after the attack on 9/11. I supported his efforts to go after Bin Laden and al Qaeda, and by extension, the Taliban, which were sheltering them in Afghanistan. And I, frankly, gave him too much of the benefit of the doubt. My view at the time — and it — and this is still true today — is that the threat of force can often create conditions to resolve matters. And sometimes what we call coercive diplomacy is necessary. And I thought that that’s what the president would do. It turned out not to be the case. And then following the invasion, the decisions that were made, everything from disbanding the military and disbanding, you know, the political structure, turned out to be very ill-advised. And we ended up with a dangerous situation, which then, you know, the Americans did not convince Maliki to allow a follow-on force that might have given us some ability to prevent Maliki from beginning to undermine the unity of Iraq. And — and so ..
ZAKARIA: You don’t buy the argument that it — that — that Obama didn’t negotiate in serious — seriously, that — that we could have gotten that follow-on agreement? CLINTON: I was part of the negotiations. I supported what we were trying to convince Maliki to do, which was a small, targeted, follow-on force to provide what the Iraqis couldn’t provide for themselves, intel, surveillance, training and the like. And I am absolutely convinced, from being in the Situation Room, that Maliki and his larger circle did not want a continuing American presence. Now, you can ask yourself why, given what has happened. And I think there are two main reasons. One, I think that Maliki and his party, which, remember, didn’t win the most votes in the first election, but were able to form a government. So he had to make a lot of political deals with various segments of Iraqi political society to form that government. And there were elements within it that did not want an American follow-on force, and that was connected, in part, to the Iranians not wanting an American follow-on force. So I mean I know what we offered and I know that we tried. And I know that Maliki and his inner circle did not want to go forward. ZAKARIA: When we come back, I will ask Hillary Clinton whether there is a deal to be had with Iran on its nuclear program. ZAKARIA: On Iran, there, you know, so negotiations are complicated, but there seems to be one fundamental issue and it’s boiled down to this. The Iranians say you can have lots of inspections, we’ll open up all our facilities, but we have to have the right to enrich just like every country that has a peaceful nuclear program does. The Israeli position, as I understand it, is no, zero enrichment, because any kind of enrichment gives them the capacity, the Iranians, to weaponize at some stage, perhaps furtively. Where do you stand on it? CLINTON: Well, as you know, I worked very hard and led our efforts to get the sanctions to be international that brought Iran to the negotiating table and sent one of my trusted advisers early in 2012 to begin that process of what — how big will the table be and who gets to sit around it and the like. And I have followed what has been done since then. This is a — this is the real nub of it, because if you cannot be persuaded that the Iranians cannot break out and race toward a nuclear weapon, then you cannot have a deal. I believe strongly that it’s really important for there to be so little enrichment or no enrichment, at least for a long period of time, because I do think that any enrichment will trigger an arms race in the Middle East. I think if the Gulf looks and says, well, if they have any enrichment, they can do this and then they can do that and then we’re off to the races, we’ve created a very dangerous situation. But if you can define that little in a way that you can convince our partners, not only in the Gulf, but in Israel and elsewhere, that it truly is so inadequate a base that you could not move to break out and if they were making moves toward break out, we would all know and then pursue other kinds of actions. But that’s the persuasive case to be made. ZAKARIA: And Jon Stewart asked you, what do you think, you know, what have you learned about American foreign policy? What’s the big take away? And you talked about how Americans didn’t tell their story well enough and they didn’t recognize that they needed to convince themselves and the world that we’ve been a force for good. ZAKARIA: So Peter Beinart writes in “The Atlantic,” “Really? Is America’s biggest cold war — post-cold war foreign policy problem that we have failed to adequately remind ourselves and others how good we are?” And his argument is that, actually, we need a little more humility, particularly after — post-Iraq and such. CLINTON: Well, I — you know, obviously, I think highly of Peter and he’s a, you know, very prolific writer on many issues. But I would take this point of view. Of course we have to be more humble and more skeptical about what we can do and what we should do. But there is a gap between how much of the world, particularly the majority of the world that is young, under 30, sees the United States and how we see ourselves. And how we see ourselves may very well fall into the mischaracterization that Peter is pointing to, that we see ourselves either as too powerful or disengaged. And we may actually be having that debate in our country right now. That’s not how I see it. I think that the United States has been the major force for peace, prosperity and progress in the country, coming out of the 20th century, when we lived in a bipolar world, we made mistakes, but we had a foreign policy consensus that cut across party lines. And it was easy. We were going to contain the Soviet Union and stop the march of communism. And by doing so, we didn’t just rely on building up our nuclear weaponry, we relied on telling our story. That’s what we did through all kinds of media, you know, the Voice of America is the most obvious example, but also the constant outreach that we were involved in. I remember Vaclav Havel telling me that, you know, during the depths of his struggle against the Soviet Union in what was then Czechoslovakia, it was American culture, it was — it was the music, it was the plays and theater that kept him going, because it gave him an understanding of what was possible. And so the, you know, the Soviet Union falls. Putin’s very upset about that. We’re very triumphant about that. And we basically felt great, we’re done. Democracy has triumphed. This is the end of history. That was so short-sighted. And now we are in this period where we have to go back out and sell ourselves. It’s not to be taken for granted. What do we stand for and how do we intend to lead and manage? How do we try to enlist the rest of the world in this struggle between cooperation and order and conflict and disorder, which is really at the root of so much that’s going on today. And I don’t think we’ve done a very good job of that. Of course, there are specifics, you know, there are all the headlines we can talk about. But the trend line, let’s not forget the trend lines. You know, George W. Bush is very popular in sub-Saharan Africa. Why? Because of PEPFAR, the president’s emergency program for AIDS relief. Whether you agree or disagree with a lot of what else he did, and I disagree with a lot of it, I am proud to be an American when I go to sub-Saharan Africa and people say I want to thank President Bush and the United States for, you know, helping us fight HIV/AIDS. You know, we spend a lot of money and a lot of time and effort trying to be influential around the world when I think we would be able to succeed more effectively if we were clearer about who we are and what we stand for and the values that we hold, obviously tempered by experience and the competing interests that we face. ZAKARIA: After a quick break, I’ll be back with more of Hillary Clinton. I’ll ask about her toughest potential presidential match-up…with Darth Vader. ZAKARIA: If you look at the last really 50 years, there have been three Democrats who have been elected, all outsiders. ZAKARIA: … a junior senator. Does that suggest that for an insider with strong Washington connections it would be tough to win the nomination and the presidency? ZAKARIA: You are a student of history. CLINTON: Yes. Well, you know what I — I think, Fareed, I think every election is sui generis. I think it — it starts with where we are in the country at this time, with what Americans are thinking, feeling and hoping. And it proceeds from there. And it’s always about the future. So whether you’ve been in office a day or you’ve been in office 20 years, you have to come to any campaign with as clear an understanding as you can get of where the country is and where you wish it to be, because, as I say in the book, the questions for somebody running for president are not, you know, will you run and can you win? I mean that’s for the political, you know, horse traders, so to speak, to opine about. It’s what’s your vision of America and can you lead us there. I think that we, perhaps, go through periods where what we want and what we need is a vision that people can hang onto, but it needs to be rooted in the hard work of getting anything done in Washington. And I think the next election will be based around the economy, around people’s standard of living, around what’s happening to the middle class in America. And whoever runs is going to have to speak candidly and come up with a set of recommendations that the American people believe would be in their interest, so that you have an election not about a candidate, but you have an election about an agenda. ZAKARIA: A final question and then we’re done. What do you make of the fact that Darth Vader is polling ahead of every potential presidential candidate? What’s the deeper meaning of that? CLINTON: … speaking all these different languages. Well, each, in their own way, is a triumph. I mean India is a triumph of a unified political nation and China has been triumphant in moving people out of poverty. But in the long run, who has the better system? And if India can now get its act together on the economy, it would be an extraordinary accomplishment, because it would be both politically and economically successful. So I know what — and people get frustrated. And people are just so fed up with the gridlock and dysfunction in Washington. The Congress is just, you know, so, unfortunately, unable to even agree on the most obvious kinds of matters, that I think, you know, Darth Vader looks pretty good to a lot of people. ZAKARIA: Hillary Clinton, a pleasure to have you on. CLINTON: Thank you, Fareed. Good to be here. Thank you very much. ZAKARIA: Thank you. And we will be back.